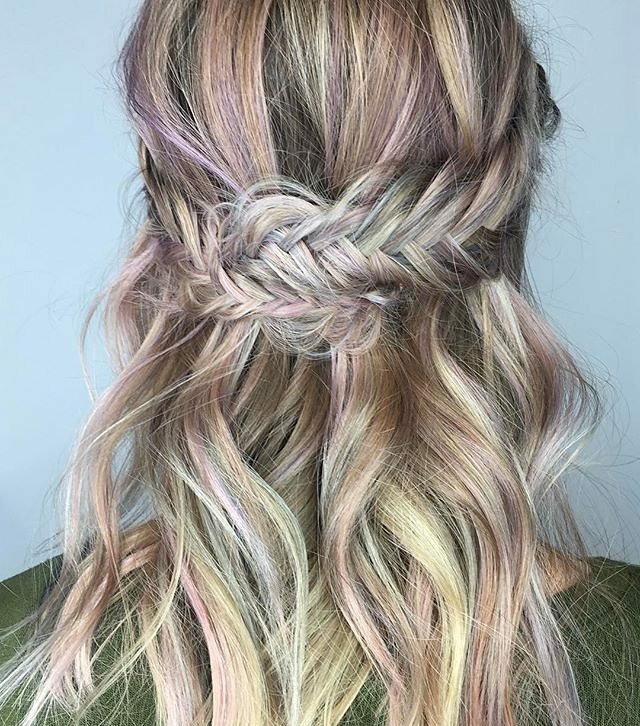 When fabulous, beige-blondes, grays and ash balayage/ombré colors hit the salons, I knew this year’s braided hairstyles would be the best ever! 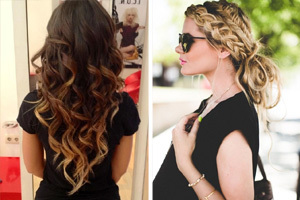 And I was right, because hair with several shades of close-matched balayage and ombré looks absolutely fabulous in the new braided hair-designs. It’s no accident that braided hairstyles have kept their place as a fashion favourite for so many years. With new colors, varied highlight/ombré styles, and ever-changing braiding methods – braids are always trendy and exciting! Braids used to look best on fairly thick, long hair. However, like everything else in hair-fashion, all that has changed! Owing to the amazing 3-D optical illusions you get with contrasting balayage colors and loose plaiting, braids appear thicker and fine hair looks fabulous in a braided hairstyle. 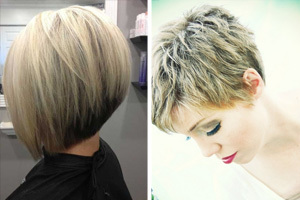 This model’s fair hair has been brightened to shades of baby- and beige-blonde and cut simply in a one-length, medium bob. But with gray and taupe roots in loosely woven head braids moving down to a V and vertical braid at the back, this look gains a ton of fashionable style! 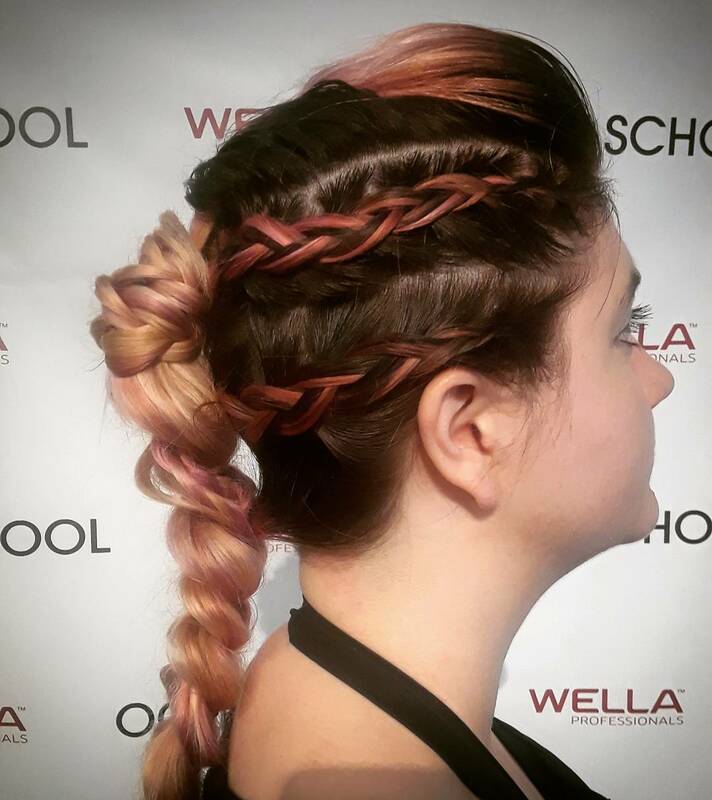 Here’s a show-stopping braided hairstyle that’s been designed to show off some fantastic color technique on a brunette base. At first glance, there appears to be three main colors brown, russet and blonde. But when you take a closer look, hey! 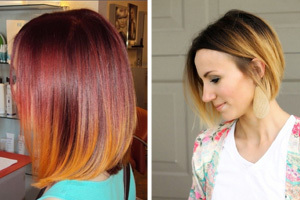 there are at least six or seven shades in the balayage-ombré! And carefully blended, multi-color balayage and ombré are this season’s signature color technique. This is probably the most important year ever for the art of hair-color. This magnificent braided hairstyle is a creative fusion including a rockabilly quiff, and clever russet-red balayage that shows up beautifully in the modern, side-braids. And the blonde ombré, with gold, beige and coral balayage gleaming with light, completes a fantastic braided hairstyle full of red-carpet fashion-flair! 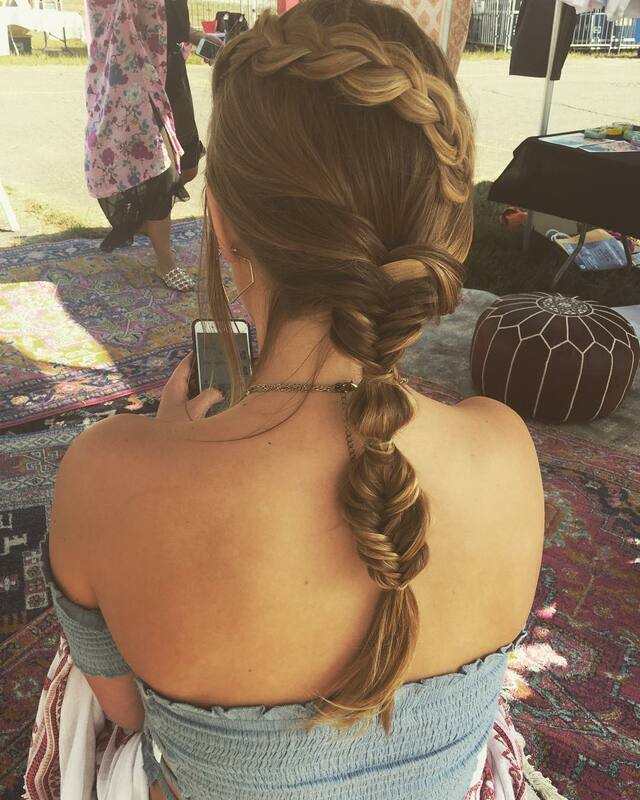 With a background of Moroccan carpets in a tent pitched on sandy terrain, this exotic braided hairstyle looks right at home! This caramel-beige balayage with golden touches and darker low-lights on a brunette base captures all the craftsmanship of a beautifully-woven carpet. The braid technique is asymmetrical, with a lovely, flat head-braid creating a soft curved pattern around the head. The lower braiding is a beautiful fusion of different styles combined into gorgeous patterns of light and shade! With the nape left mostly bare, this is a cool style for holidays and hot weather! This style suits long, thick hair as the low, centre-back pony-tail must have natural volume from lower layers only. The colors are a classy blend of light-brown, beige, blonde – all with copper tones giving warmth. These colors are flattering to medium skin color with a warm undertone and I can’t think of a more fashionable way to get some extra color into a mousey-brown base. The balayage highlighting is done with an expert touch to create amazing side-patterning. And in the two loose braids broader streaks of lighter and darker color create a wonderful 3-D effect. This style is suitable for teens having a special style and color salon visit for a cute prom hairstyle or brides-maid hairdo. The circle braid is a traditional ‘country’ braided hairstyle associated with young women attending a special social event. But this young model has a trendy balayage-ombré technique adding a little more sophistication to the loose waves cascading down to her waist. 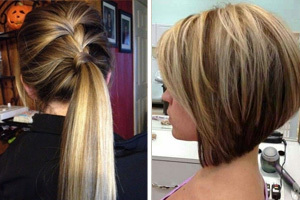 Soft beige-blondes and ash-brown lowlights, can be carefully applied to boost the density of long hair with a 3-D effect. And a subtle blend adds lots of movement and texture to tousled, defined waves! Many brides and their attendants prefer a semi-formal look these days. For brides seeking something different, but still special enough for a bridal look, this is perfect! 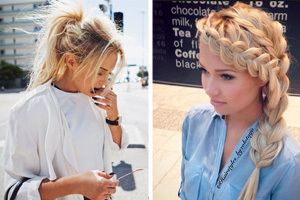 It’s a very trendy new take on the braided hairstyle that will stay looking great for many hours. And you won’t be worrying that the back is coming ‘undone’. 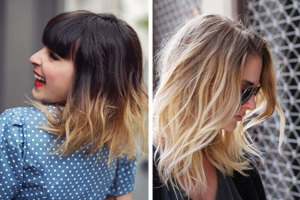 The balayage in muted beige is a flattering mid-blonde shade, suitable for skin with a warm undertone. (And for women of all ages, by the way.) The fish-bone head-braid is traditional, but the rolls, twists and tousled swirls beneath add an attractive, modern vibe. 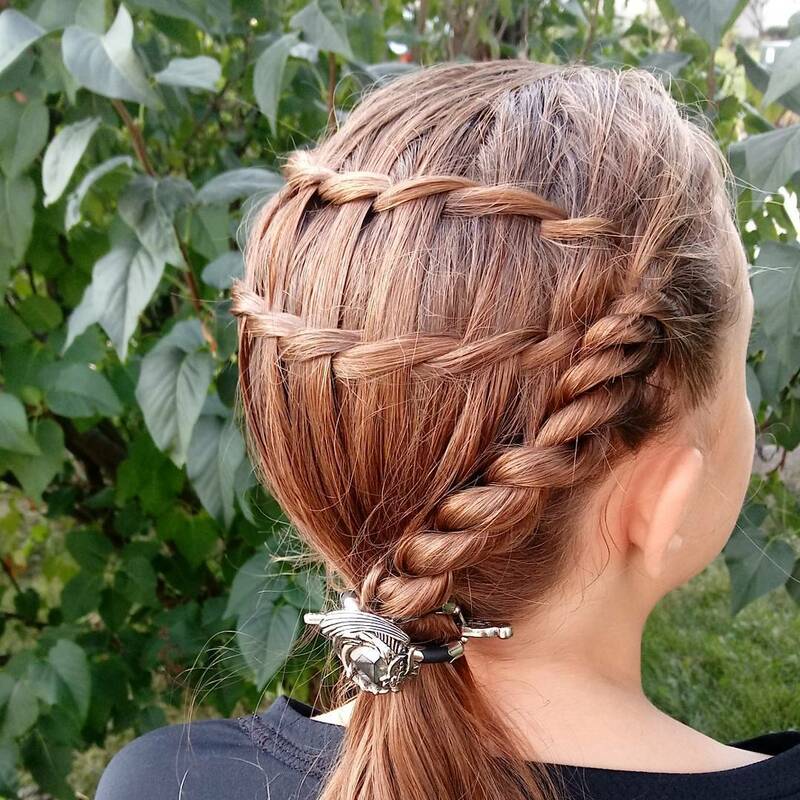 Here’s a lovely braided hairstyle suitable for fashion-obsessed teens, which isn’t in any way ‘too old’. The model may be incredibly lucky to have natural, russet colored hair or her lovely long hair has been enhanced with a subtle color-wash. That’s the beauty of this expert color job, it’s very natural-looking. 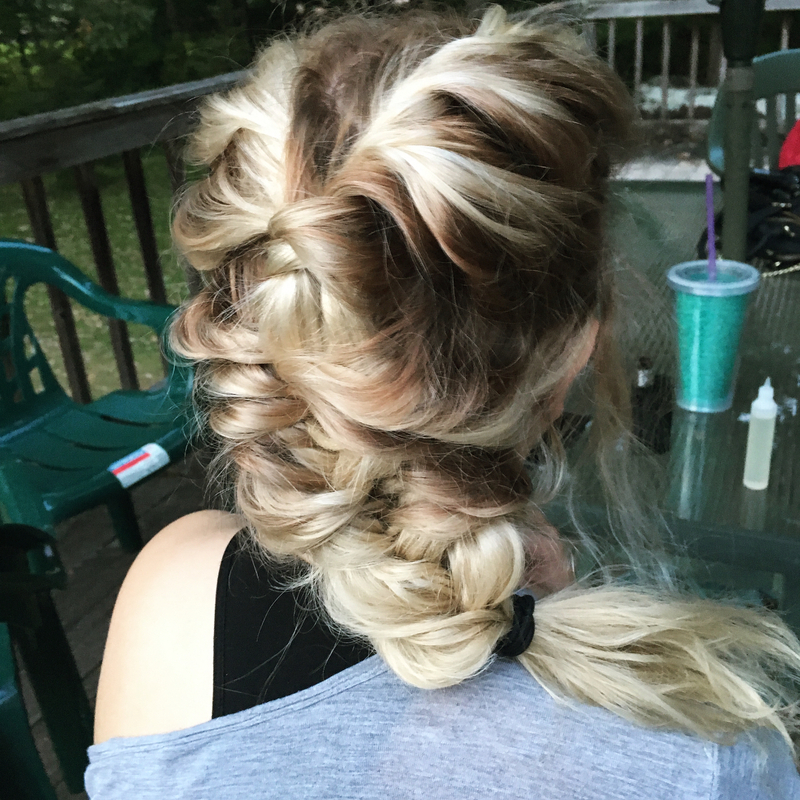 The braiding is uncomplicated, so it can be done at home and worn anytime. Horizontal strands create attractive pattern and texture at the back, and the twisted side-strands add trendy asymmetry. This is a very cute braid and ponytail hairstyle with a modern, ponytail decoration. If you prefer a chic, hair-fashion look and usually flinch at the mention of ‘rainbow’ hair-colors, maybe this will change your mind! This super-cool, boho twist on rainbow hair is muted, yet full of gleaming light reflections. With expert judgement this colorist has brought at least seven colors together, with a fashionable faded finish and ash-tones! This is a fantasy hair-color design, but not a gaudy look in any way. The texture and patterns in the fish-braids decorate the hair with a modern, pearlized gleam and tousled waves finish off a gorgeous, futurist braided hairstyle! Copper-toned beige shades are popping up everywhere this season and they are great for adding warmth to pale-blonde hair. I must admit that I think dark-brown roots are too dated to keep wearing now. And that’s because I’ve been seduced by the gorgeously soft and unusually flattering beige- and copper-blonde colors appearing in so many new hair-fashion images. 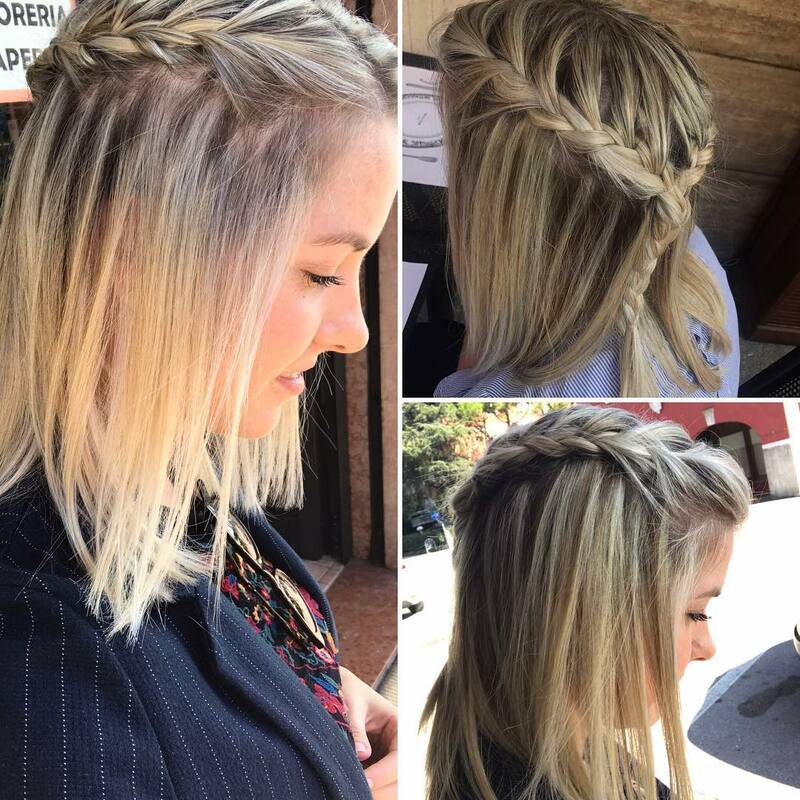 This platinum-blonde braided hairstyle looks so new and trendy with warm copper-blonde roots, it’s a totally young and carefree hairstyle. And the final, fabulous braided hairstyle in today’s master-class is a four-strand, back-braid for thick hair. The simple style is easy-care and great for a quick getaway in the mornings. 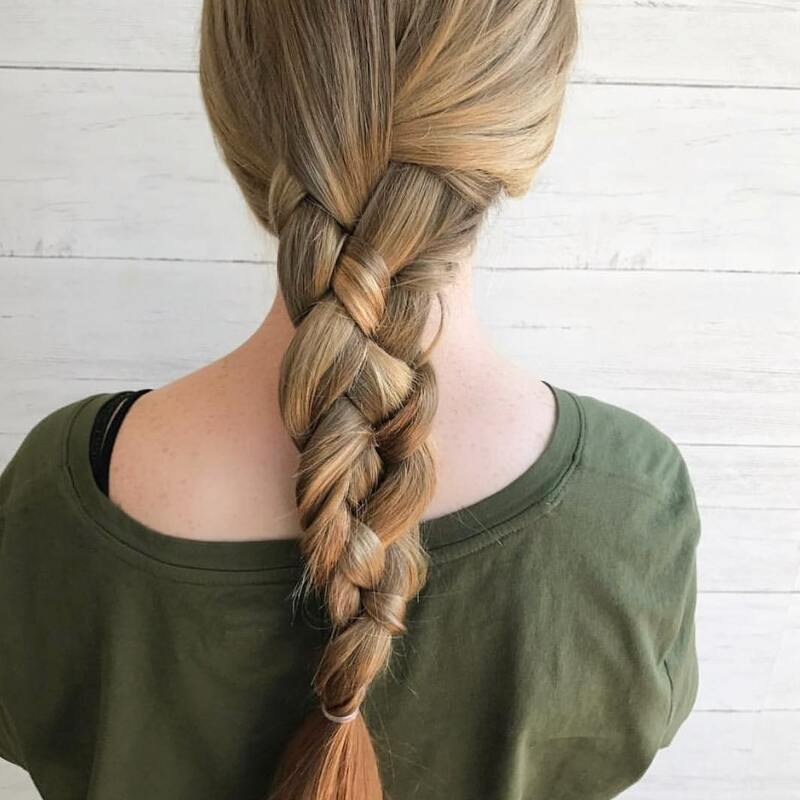 But in taupe (light-ash-brown), mingled with copper-blonde and beige shades a simple braid gains about a million style-points! These shades suit pale skin with warm undertones, like the model above. So if you have warm skin undertones, choose warm-beige, light taupe, faded-coral and soft copper-blonde balayage/ombré instead of bright colors. 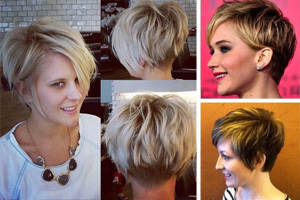 Any color softened by beige gives the gentle look that’s so flattering right now!